Cook’s Illustrated is not ordinary run of the mill food magazine. This is a magazine for true foodies and for those who are genuinely passionate about food and the preparation of food. The people behind the scenes of Cook’s Illustrated test and retest their recipes using various techniques and ingredients to find the perfect recipe to share with their readers. The magazine also applies this process of testing and evaluating to kitchen tools and products, which is a great resource when one is researching the best product to buy in one’s budget. 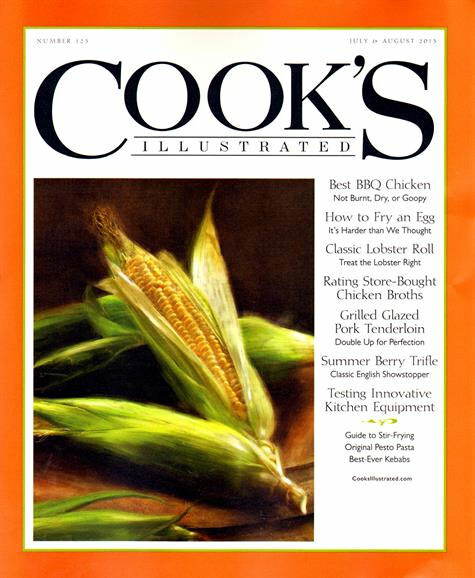 Cook’s Illustrated is published bimonthly by America’s Test Kitchen. This magazine is popular for a reason – it is highly informative and you can trust that the recipes will be good. This is not your run of the mill food magazine, that is for sure. I really do enjoy reading this magazine and have never come across anything quite like it. This magazine is like a work of art but for food! The step by step guides are awesome for novices like myself. I’m a starting chef and I always have this magazine in my stock for good reads. They have quite good recipes and guides and their pictures of food are really good. Cooks Illustrated is the best of the best. Most of the food magazines that you see have the same recipes month after month; not Cooks Illustrated, they offer new and inspired dishes in every issue. It is well worth the asking price to get that kind of information. I love Cooks Illustrated. You need to be very “into it” to feel this magazine, but if you are a full on foodie like myself it’s great. I love this magazine. It is written and illustrated magnificently.